The third time's a charm for writer/director Ben Falcone and his wife/collaborator Melissa McCarthy. After making the abysmal Tammy together and the more competent if not still narratively flawed The Boss, the husband/wife creative team have finally delivered a movie that has not just a fun enough comedic presence, but characters that really click and who are put in situations that we can't wait to see them thrive or hysterically try to survive in. Low expectations may have played a role in how much I enjoyed Life of the Party, but from the get-go we are aware of who McCarthy's Deanna is; we've met someone like her in our own lives. Her sweaters are beyond glorious. The supporting cast of Gillian Jacobs as Coma Girl, Debby Ryan as the token mean girl, Jessie Ennis as this completely weird, but totally endearing fellow sorority sister to Deanna's daughter, Maddie (Molly Gordon), are each fantastic in their own well-defined way. That's not mentioning SNL's Heidi Gardner as Deanna's agoraphobic new roommate, Chris Parnell as a corny archaeology professor, Matt Walsh as the tool bag ex-husband and Julie Bowen as his new bride-to-be who are each provided their moments to shine. Think that's all? Nope. 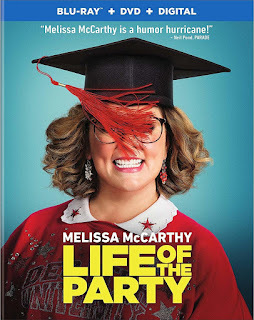 Maya Rudolph steals every scene she's in, Stephen Root and Jacki Weaver are adorably clueless as Deanna's parents, and Luke Benward who initially seems he will serve no purpose other than eye candy turns in a strong comedic turn and whose role in the story sets up one of the best and most surprising scenes the movie has to offer. This required and deserved an R-rating. Richard Cabral is the only actor here that seems to know what type of movie he's in. Well, him and Levi Meaden's dye job. Cobral plays every scene with the perfect balance of cheap, cheese, and cliché. Coralie Fargeat's Revenge is, from the outside, a pretty standard exercise in retaliation with some bloody gore and satisfying moments of, well...revenge. More than this though, the way it breaks between who Matilda Lutz's Jen is and how she is treated and who she becomes and ultimately treats those that mistreated her is a fantasy that, if one picks up on the bigger ideas, makes this neon-colored, techno-scored tale of vengeance much less of a fun diversion (which it can totally be taken as if that's all you want from it). More, Fargeat (who also wrote the screenplay) reminds us of how easy it is for people to be taken advantage of and how much of a shame it is that justice is rarely ever served-properly or not.